After a considerable stretch of warm weather in the past week or two in Michigan, temperatures have finally dropped to their norms for this time of the year. The weather was warm and sunny last weekend and so I decided to take a trip out to a new area with Chris Boguslawski to scout some massasauga habitat on state land. The more time I've spent in the field with massasaugas, the more I've learned how diverse their habitat in Michigan can be. I've found them in open canopy wetlands such as prairie fens and wet meadows, lake edges, tamarack swamps, and even in woodlands. 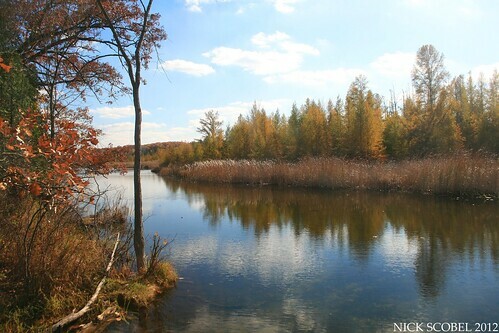 The tamarack swamps and floodplain forests which line this river are ideal habitat for Michigan's only venomous species of snake. We decided to walk some of these areas on Sunday afternoon, the sun was shining and temps were hovering in the low 60s. The thick underbrush in this habitat made navigating through it a bit difficult, but I was optimistic about our chances of seeing a rattlesnake out basking. Within a few short minutes, I came across this hefty adult trying to soak up some late October sun. 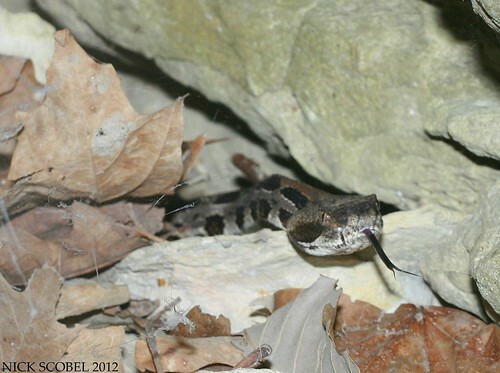 This snake showed clear signs of having spent time in a crayfish burrow, but was still sharp. 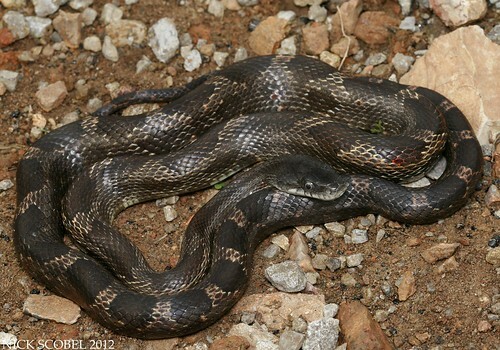 But upon further investigation, the snake appeared to have a large, bulbous sore on its neck the size of a half dollar. 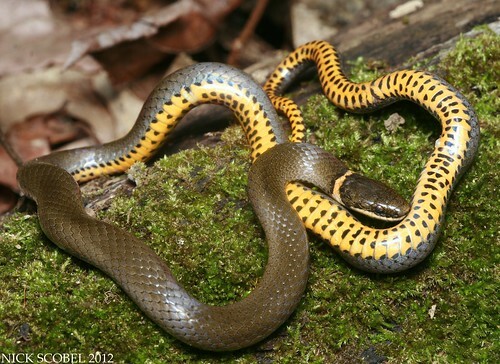 I've seen photos of others snakes with large sores like this, sometimes they can be sores from below breezing temperatures and other times it can just be an injury in the process of healing. 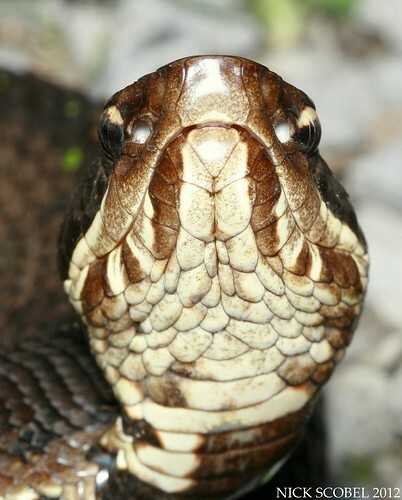 There are other concerns with this type of abscess, one of Illinois' only viable populations had recently been hit by a fungal infection which has been fatal to several snakes, usually due large tumors on the head and neck. 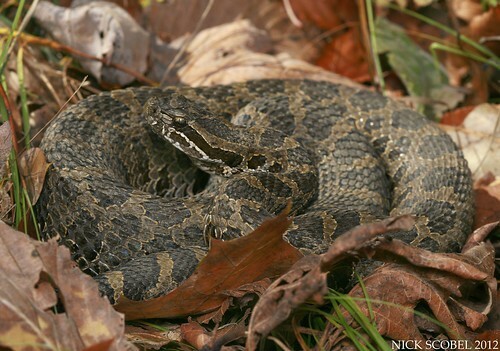 You can read about that issue here; Fungal Infection Poses a New Threat to the Eastern Massasauga. Nonetheless, it was great to find a massasauga at a new site so late in the season. But it will be something to keep an eye on with this population in the future. The first weekend of October drew me to the Shawnee National Forest of southern Illinois for the first NAFHA national meeting. 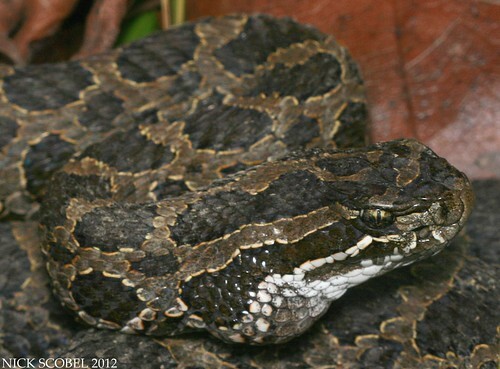 More than seventy herpers from across the country descended upon Snake Road and its surrounding areas for a weekend of camaraderie, shenanigans, and of course, snakes. Seeing that the weather forecast looked abysmal for the latter half of the weekend, Chris Boguslawski and I decided to head down earlier in the week in hopes of catching at least a day of warm temperatures and sunny skies. After rolling in at close to 3 AM local time, we were up Thursday morning at 7 AM for an hour drive to the north to flip a tin site I had been told about by a friend. 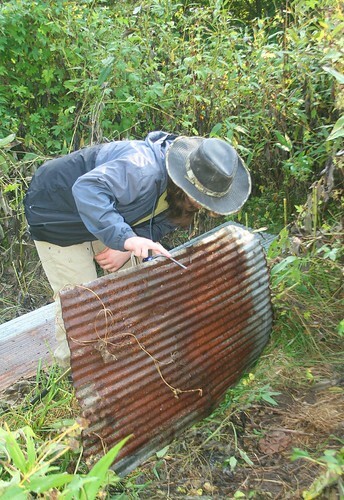 We arrived to an abandoned site near a large stretch of bluffs with lots of tin around it. Withing a few minutes, Chris called out that he had a snake, the snake we drove an hour to see. 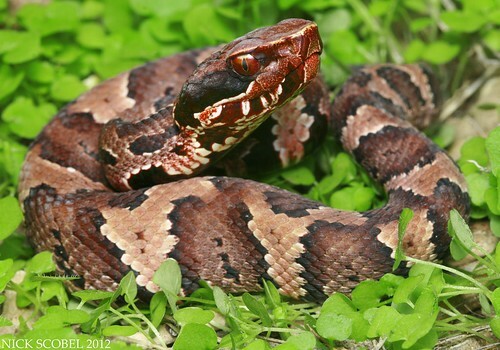 One of the best looking North American pitvipers, copperheads are masters of camouflage. Their hourglass-shaped crossbands make them virtually impossible to see when concealed beneath leaf litter. 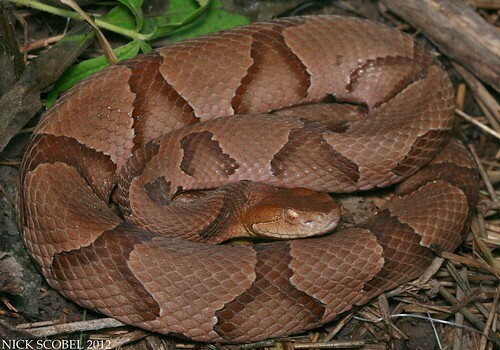 Copperheads from this region of southern Illinois show quite a bit of variation due to the genetic influence of the northern & Osage "subspecies" whose ranges encroach on this area. Some individuals may look identical to the northern subspecies, exhibiting scattered dots in the lighter areas between the darker crossbands. Meanwhile others; like this individual, look more to the likes of the Osage subspecies, exhibiting clean crossbands and no dots. Regardless, this was a beautiful snake that never moved as we took a few quick photos and then gently set the tin back down on top of it. The weather was warming, so we decided to head back to snake road and get on it as soon as possible. It didn't take us long to get our first snake, but it was not the obligatory cottonmouth we were expecting to see first. 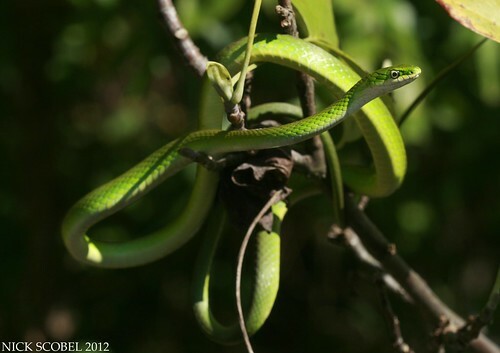 This arboreal relative of the Smooth Green Snake (Opheodrys vernalis) is an adept climber and is often found in low lying shrubs and trees where it forages on insects and other soft-bodied arthropods. This species appears to be quite abundant in southern Illinois and is always a treat to see, we ended up seeing more than a dozen on this day. We took a few photos of this snake and then continued to make our way down the road. Snake Road is a pretty amazing place to say the least. 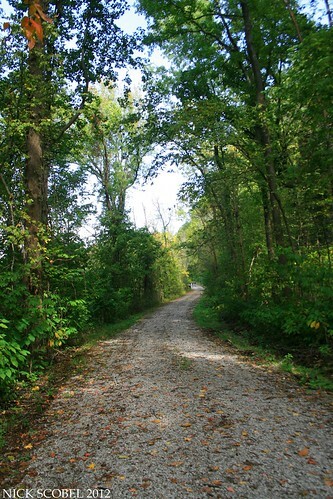 The gravel road meanders between a large cypress swamp and tall limestone bluffs for more than two and a half miles. There are several points along the road where the swamp and bluffs are just a short distance from each other, as we approached this first swamp crossing, the usual suspects began to make an appearance. 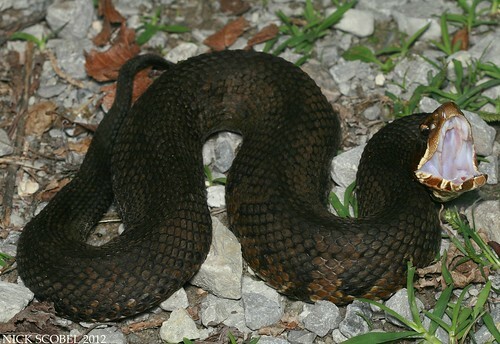 This big cottonmouth had just come out of the swamp and was heading towards the bluffs. Though it was fairly unwilling to gape, it did hold its head straight up in a very defense fashion. Not too far away, I spotted this very brightly colored juvenile near the edge of the swamp. Finding cottonmouths in close proximity would be the common theme of the day as we ended up seeing more than fifty individuals on the road, near the swamp, and along the bluffs. We continued further down the road and saw a few more moccasins and the occasional green snake and ribbon snake. As we neared another swamp crossing, Chris spotted this pretty little Nerodia. This would be the only species of water snake we would see on the weekend, with Mississippi Greens and Diamondbacks remaining elusive. The day rolled onward and provided plenty more of the usual suspects. 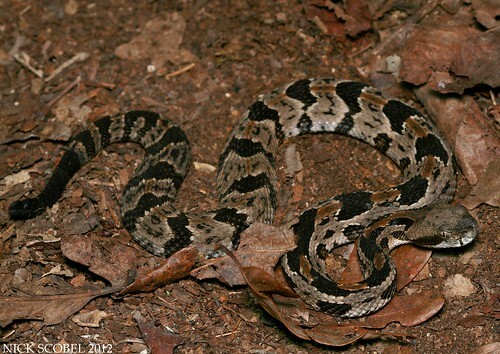 We pumped into several herpers along the way who had mentioned they had seen timber rattlesnakes the day before in the late afternoon, yet despite our efforts walking high into the bluffs we had not seen the third species in the southern Illinois pitviper trifecta. As we were nearing the end of our day, I noticed on large bluff face was being hit by the sun really well and decided to go check it out. Needless to say I was pretty excited when I spotted this juvenile timber make its way back toward the bluff wall. Timbers in the Midwest do not den in the large numbers that are often seen at den sites in the northeastern United States, so dens are a lot more difficult to locate and check. But I did see another timber at this exact same spot a few years ago. Probably a yearling snake, this young horridus sported some very nice serrated chevrons, a dark post-ocular stripe, and a nice rusty dorsal stripe, all characteristic of timbers from the western part of the species' range. I didn't bother the snake too long for photos and after parting ways we called it a night. The next day brought some rather unfriendly weather. But earlier on in the morning, the sun was out and so we decided to spot hop a bit before heading to the road. Friday ended up being a great day for a species I didn't see last year or the previous day. It was cool to see the transition that this species goes through in terms of appearance as they age from neonates to adults. 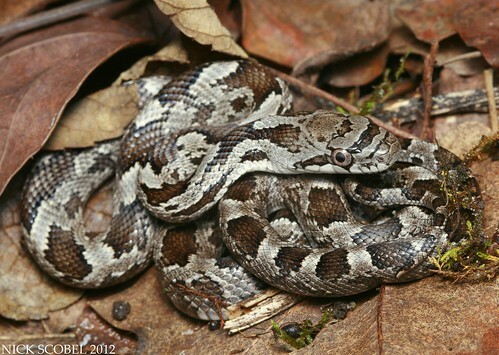 The neonate was found along the bluffs amid a light rain in the mid afternoon. Earlier in the morning Chris and I cruised the sub-adult; which was about 2 feet long, along a rural road in the farm country. The nice adult was found scaling the bluff wall much later in the day during a heavy downpour. 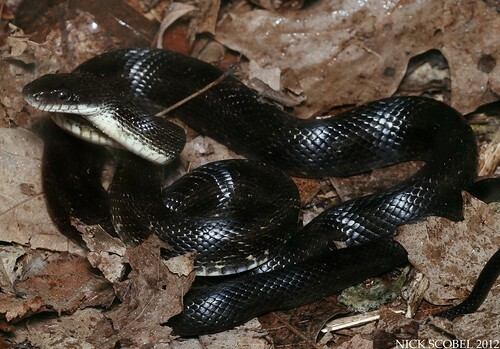 While a large group of herpers was photographing the black rat snake, part of the group moved farther up the bluff wall to stay dry and stepped precariously close to a known timber den. I was a bit surprised when someone in group yelled, "Timber!" I ran a short distance to see this adult timber poking its head out of its den. This was the best photo I could manage before the rest of the group startled the snake back into its den. Based off the size of the head, the snake was probably in the three foot range. It's hard to know why it was thinking about coming out amid a heavy rain and temps in the low 50s, but I wasn't complaining. The inclement weather would cut the day shore, but Friday night was filled with lots of shenanigans around the campfire. It was great to catch up with people that I had herped literally all over the place and share a few drinks and laughs. Saturday would turn out to be one of the most interesting days I've ever had at snake road. Temperatures would only reach the mid 50s with scattered sun and clouds. Our first snake of the morning was this sharp cottonmouth on its way to its den. 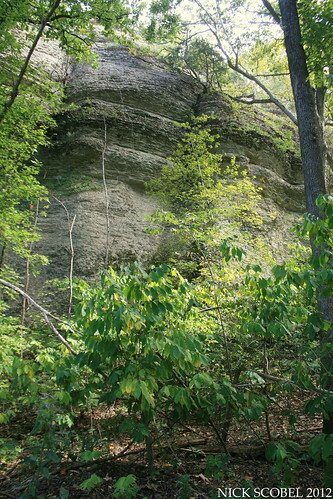 Surprisingly cottonmouths would be in short supply on this day, with most being seen with their heads merely poking out of crevices in the bluffs. We decided to flip as many rocks as we could in hopes of seeing some of the fossorial species in the area. Not long after, someone in a group ahead of us flipped this beautiful little earth snake under a large rock. 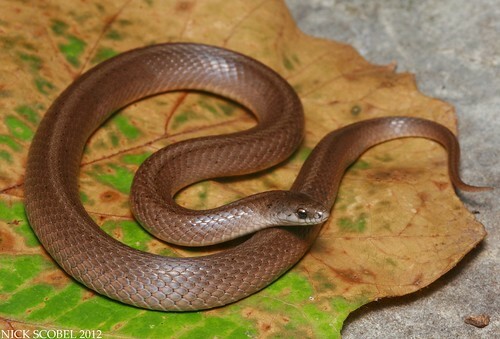 A secretive species, earth snakes spend much of their time burrowing underground in search of insects. 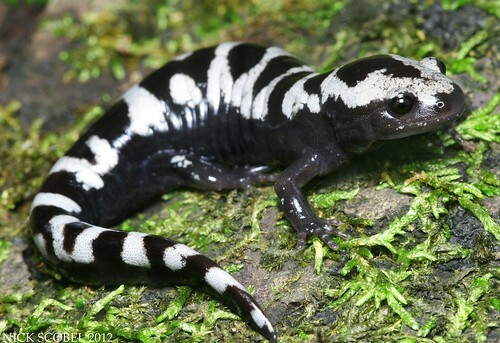 They can occasionally be found under rocks and other sorts of cover in sloped environments. This individual was in great shape and a rather hefty individual for this species, probably 7-8 inches in length. We continued up the road and Colin Boguslawski flipped this beautiful ringneck snake near the north end. 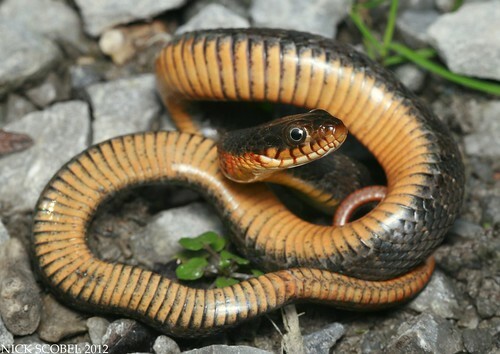 Just like the copperheads from this region, ringneck snakes here also show a lot of phenotypic variation. Some individuals may have heavy spotting like the individual above, while others may have no spotting at all and appear to be like the northern subspecies (D. p. edwardsii). This individual was found in a large woodpile along with a few other individuals. As we headed back down the road, we got word that ahead of us a group had flipped a copperhead under a rock. We finally arrived to to a large group of herpers huddled around this little beauty which ended up being the rockstar of the weekend. A truly gorgeous snake, this little fella had much more of a northern copperhead look to it than the individual that we flipped a few days earlier. 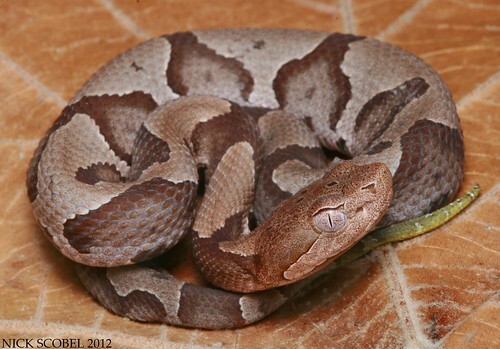 Like other North American pitvipers, neonate copperheads exhibit a bright yellow tail which is used in caudal luring. We didn't bother this snake too much and then headed back town the road just in time for a member of our group to find this beautiful snake, one species I haven't seen at snake road since my first trip down. 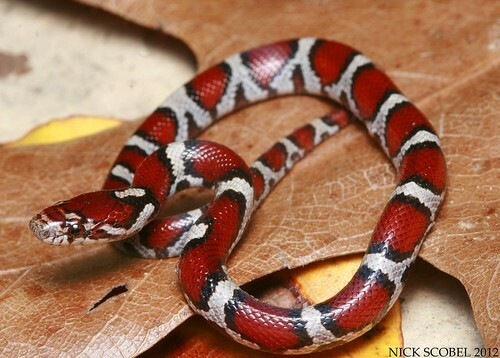 A more colorful subspecies than the eastern milk snake, red milks retain this bright red coloration throughout adulthood. 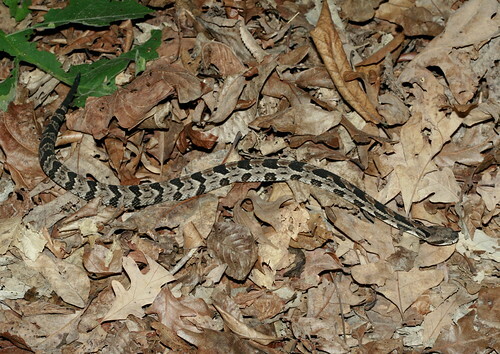 This neonate was found crawling along the bluff wall by Matt Boguslawski who was pretty bummed about missing out on the two timbers and copperheads earlier in the trip, I'm sure glad he managed to make this find. This snake also drew a large crowd and was the second most photographed snake of the weekend behind the neonate copperhead. A few more common things were found throughout the day, but nothing more exciting made an appearance in the cool weather conditions. We did stop by a few tin sites in the rain in hopes of finding some snakes taking cover, but all we found was a few of these pretty Plethodontids. The next morning took us to another well known site in hopes of finding a mudsnake and salamander species. While flipping some cover in some lowland areas of a cypress swamp, a few Ambystomatids turned up. 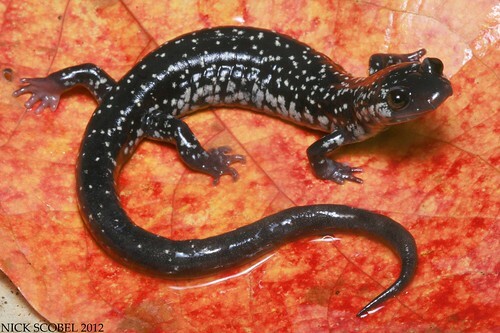 One group did fine a Mole Salamander (Ambystoma talpoideum) but lost it before our group could get to them for photos. We headed further down the tracks, flipping cover along the way and one member of the large group pulled this monstrous racer out of some vegetation. 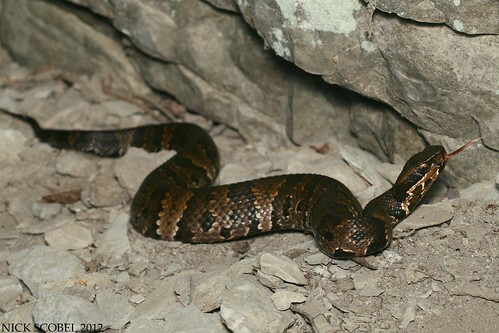 Nearby, a small cottonmouth was flipped under a railroad tie and Daniel Dye's wife Yvonne called out that she had flipped a snake under a rock on a rocky hillside, but lost it. A group of us rushed over and began raking through the leaf litter and before long I saw a flash of red and pulled this little beauty out. This small fossorial species is a personal favorite of mine, especially the individuals from this region of the country. 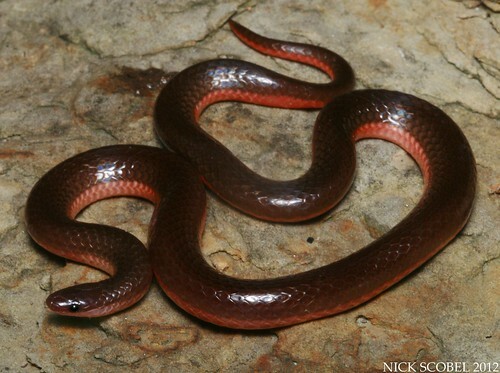 Worm snakes here exhibit a chocolate brown dorsum with a bright pinkish-red ventral surface and are extremely attractive snakes. I spent a good amount of time photographing this snake before spending the next our or so flipping logs in the cypress swamp for mudsnakes to no avail. 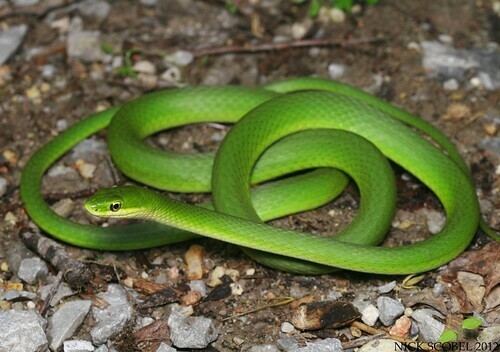 As we were walking the tracks on our way out, Chris Haas spotted this beautiful green snake basking on the ballast rock of the railroad embankment and was able to get it in hand for his lifer. This snake was a great way to close a pretty awesome trip. 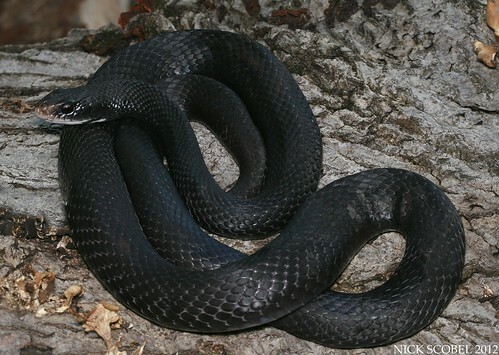 We ended up seeing sixteen snake species on the trip and managed to completely the pitviper trifecta for second year in a row, though mudsnakes remained elusive once again. It was a fantastic weekend overall filled with lots of great field time and plenty of quality laughs around the campfire. I can only hope to once again attend a NAFHA meeting to catch up with everyone once again. Somewhere in the woods, that's where you'll find me. For as long as I can remember, I've had a keen interest in nature and spend much of my spare time in the pursuit of new adventures in the field. 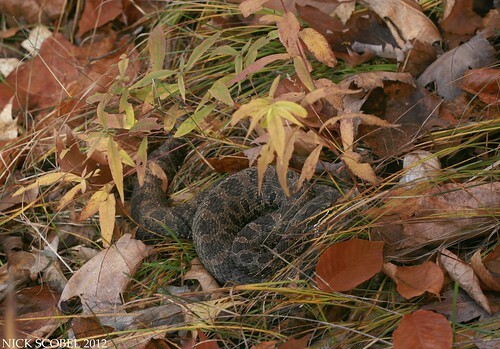 Herps (reptiles & amphibians) have always been my first love, particularly a cool little rattlesnake that we have here in Michigan. I'm also an avid fisherman that enjoys most freshwater game fish, particularly largemouth and smallmouth bass. More recently, I've taken up an interest in birding. It's been thoroughly enjoyable pursuing owls and other cool birds. 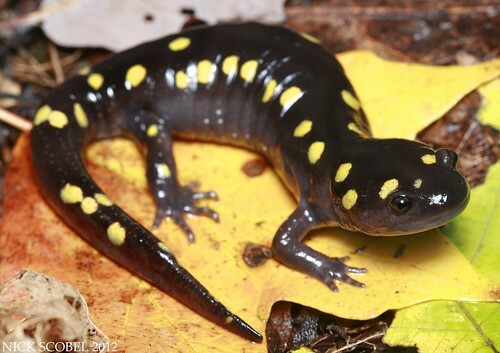 This blog will continue to be primarily focused on herpetofauna, but expect to see more birding related posts and the occasional posts on fishing. Welcome, have a look around and enjoy!